You come to the SAP initial screen. Note that after each step, you can use the Back Button to quickly return to the IMG menu screen. A Human Resource Management System enables you to set up organizational hierarchies and employee relationships and then store and administer employee data in the system. The structures of an enterprise are subdivided into organizational structures, based on an organizational plan, and administrative structures, based on the enterprise and personnel structures. A Company is generally used in the legal consolidation module to roll up financial statements of several company codes. Give the Company Name and Address. Note: We need to create this request once when you save first time in user ID. A company code is representative of a stand-alone legal entity that requires its own set of accounting records for reporting purposes. 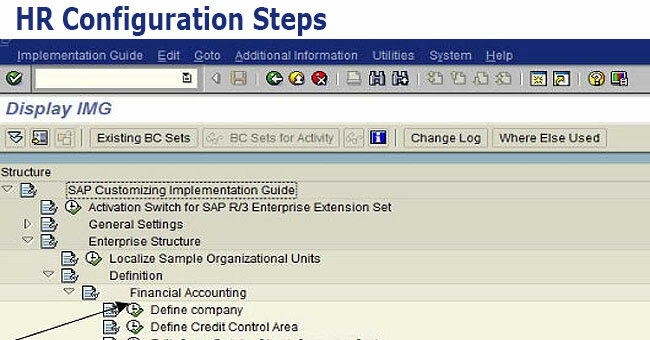 Menu Path: SAP Reference IMG -> Enterprise Structure -> Definition->Financial Accounting -> Define, copy, delete, check Company Code. Give Company Code identifier and additional data. Press save button. Give all the additional detail for the Company Code. Double click on Personnel Areas. Give four digit identifier for your Personnel Area and additional information. Give all the details about Personnel Area.